Diverticular disease is a common illness that forms in the large intestine as individuals age. During digestion, food travels along the large intestine. Over time, the walls of the large intestine can lose strength. Some spots will weaken so much so that they will start to bulge outward, forming small pockets calls diverticula. The pockets usually do not cause any problems. Diverticula are actually quite common, especially in individuals who are over the age of forty. It is estimated that about 65% of adults will develop diverticular disease by the age of 80. About 10 to 30% of people with diverticular disease will suffer complications such as diverticulitis and/or diverticular bleeding. Diverticulitis only occurs when these pockets become infected or inflamed. This can lead to extreme abdominal pain and may require surgery in some cases. However, mild diverticulitis can be treated with rest and lifestyle adjustments. Diverticula like to develop when a spot in your colon gives way under pressure. This causes olive-sized pouches to break through the colon wall. When the diverticula break, inflammation or infection can occur. There a variety of factors that contribute to the risk of developing diverticulitis. This illness becomes increasingly common as people age. It is diagnosed more often in people over the age of forty. Obesity is associated with a number of digestive diseases, and it can increase the chance of developing diverticulitis too. Similarly, a low-fiber diet increases the risk of diverticulitis. Individuals who smoke cigarettes are at a higher risk for developing diverticular disease and diverticulitis than those who do not smoke. Lack of exercise. Little or no exercise has been found to increase the risk of diverticulitis. Abundance of red meat. Doctors are not sure why, or what constitutes too much, but eating a lot of red meat can trigger diverticulitis. Try consuming leaner meats, like chicken or fish. Certain medications. 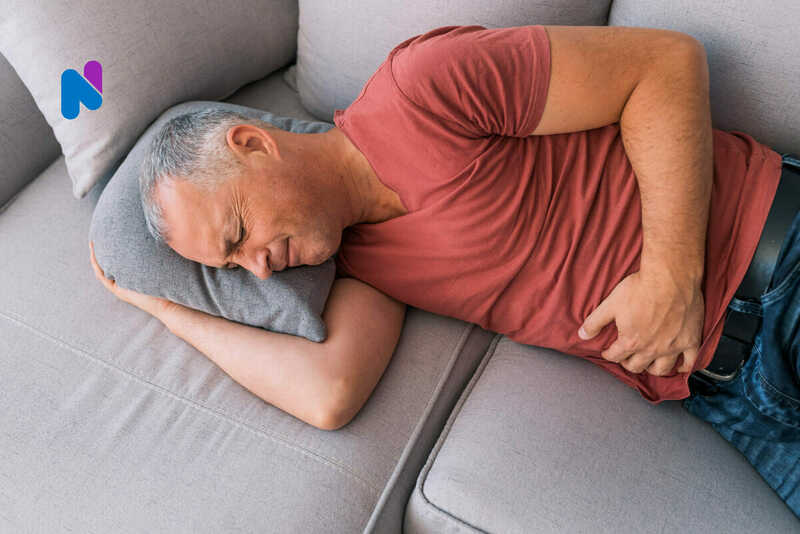 A few drugs, such as steroids, opioids, and medications related to ibuprofen and naproxen sodium, are known to put an individual at a greater risk of developing diverticulitis. Symptoms may not always be obvious in cases of diverticulitis. The most common symptom people have is sharp pain in the lower left abdominal region. Other symptoms include nausea, chills, cramping, changes in bowel movements, and fever. The best way to prevent diverticulitis is by maintaining a healthy lifestyle. The following methods will help you reduce the risk of getting diverticulitis. Exercise regularly. Exercise will reduce the pressure inside the colon and will aid in normal bowel function. Exercise does not need to be intense. Simply walking every day is great, so long as it is maintained regularly. Eat more fiber. A diet that is filled with fiber will decrease the risk of diverticulitis. Foods high in fiber such as whole grains and vegetables will soften waste material and allow it to pass faster through the colon. Drink plenty of fluids. When you increase your fiber intake, you will need to increase your intake of fluids too. Fluids act as natural lubricants within the body’s digestive tract. Stay hydrated by drinking the recommended 8 glasses of water a day. Diverticulitis can be difficult to diagnose. Typically, it will go undiagnosed until the symptoms occur. A person with diverticulitis may only know they have the disease once they experience extreme stomach pain and go to the hospital. However, it is common for physicians to find diverticulitis when looking for the cause of other symptoms or during a routine colonoscopy. Colonoscopy. This test is usually performed to check out symptoms relating to bleeding or abdominal pain. It is a required routine screening for people over the age of 50. A colonoscopy can lead to the diagnosis of asymptomatic diverticular disease. From there, the patient may be able to make lifestyle adjustments to prevent diverticulitis. Computerized Tomography Scan. This scan consists of a series of x-rays that offer a view of the abdomen and other areas of the body. This scan is usually non-invasive and painless. In some instances, a dye is used to strengthen the visibility of some structures. The dye helps medical professionals visualize organs in the body and look for anything out of the ordinary, like diverticula. Treatment of diverticulitis often begins with increasing the amount of fiber in an individual’s diet. The majority of people in the U.S do not consume enough fiber. Foods that are high in fiber keep stool soft and allows it easily to pass through the body. Refined and processed foods are low in fiber and increase the likelihood of obesity, two risk factors for developing diverticulitis. During urgent or serious cases, surgery can be performed. Every year, about 200,000 people are hospitalized for diverticulitis. Individuals who are diagnosed with diverticular disease should speak with a medical professional about which treatment plan is best for them in order to reduce the risk of diverticulitis. People should always speak to their doctor or a specialized gastroenterologist with any specific questions. For people who been hospitalized for diverticulitis, a private duty nurse can help with recovery care to get you back home quickly and safely. Nurses are available for short, hourly visits or overnight care. If you would like to learn more about how a skilled nurse can help with your care, call 650-462-1001 to speak with a Client Care Coordinator. You can also view our Post-Hospital Discharge Planning Guide for free. The Gastrointestinal Society offers a variety of resources for individuals with diverticulitis. Helpful resources can be found on the American College of Gastroenterology webpage. The American Gastroenterological Association has plenty of information to help cope with the illness and prevent recurrences. American Society for Gastrointestinal Endoscopy offers guidance on fiber-rich foods to include in your diet. Disclaimer: The information provided in this article is not intended to diagnose health problems or take the place of professional medical advice or care you receive from a health care provider. A diagnosis for diverticulitis must be confirmed with a licensed medical professional. Always consult your healthcare provider about symptoms, health problems, medications, and treatments.